This is definitely my favorite time of year. Decorating the house for the holiday season is one of my favorite things to do! To be honest, I try to transform our house into a Winter Wonderland during the month of December. Over the years, I have amassed quite a collection of Christmas decor. I think we are up to 5-6 large storage bins and that doesn’t even include the Christmas tree or outdoor decor. Despite my sizable collection of Christmas decorations, I always like to make some homemade pieces. 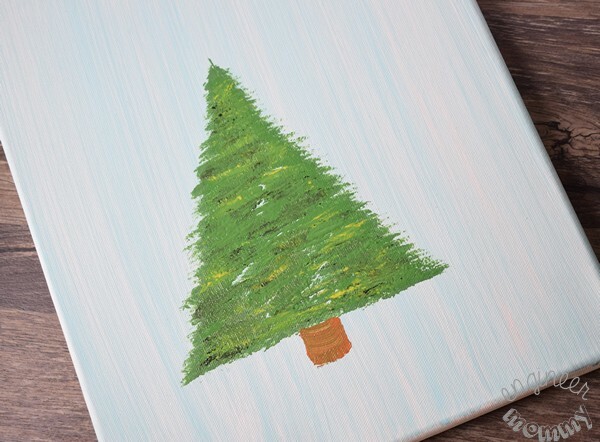 Today I’ll show you how to make a DIY Christmas Tree canvas – it makes the perfect wall art! To make this artwork, all you need is a handful of basic supplies and about 30 minutes of time. I’ll be putting this into my guest bathroom as a festive touch for the holiday season. We host Christmas at our house every year so getting our home ready for guests is very important. 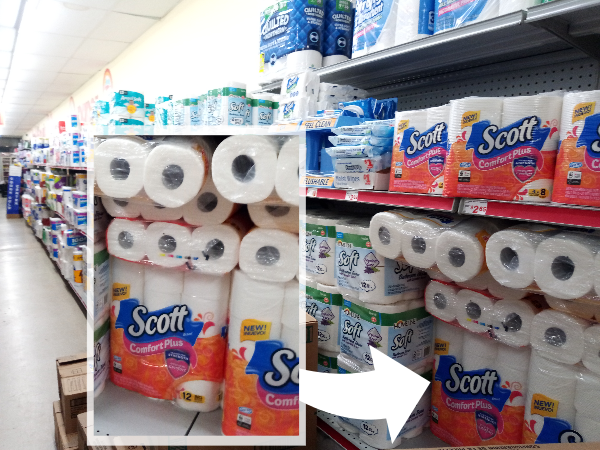 One thing I like to do is stock up on Scott® ComfortPlus™ Toilet Paper (12 CT Big Roll) from Family Dollar, because it’s a great value on our favorite brand. In fact, there’s a circular offer available from 12/4-12/10, where you can get the 12 CT Big Roll for only $4. 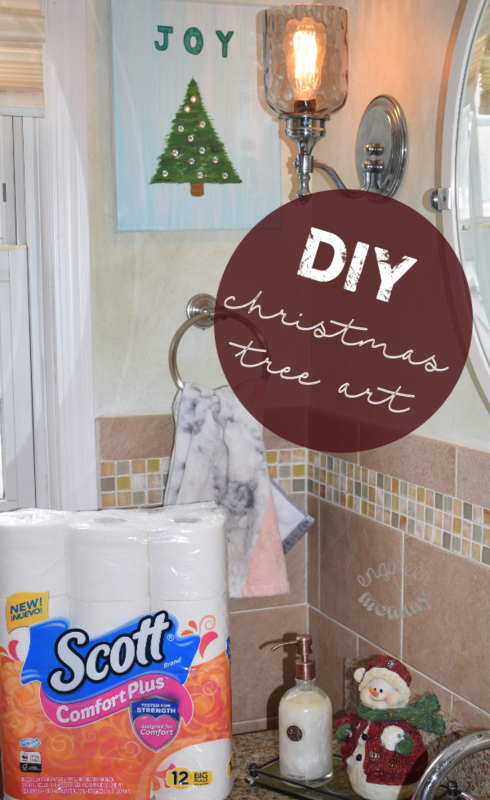 Toward the end of this post, I’ll also be sharing some other quick, easy ways to spruce up the bathroom for guests this holiday season. Ready for a sneak peek at the canvas? 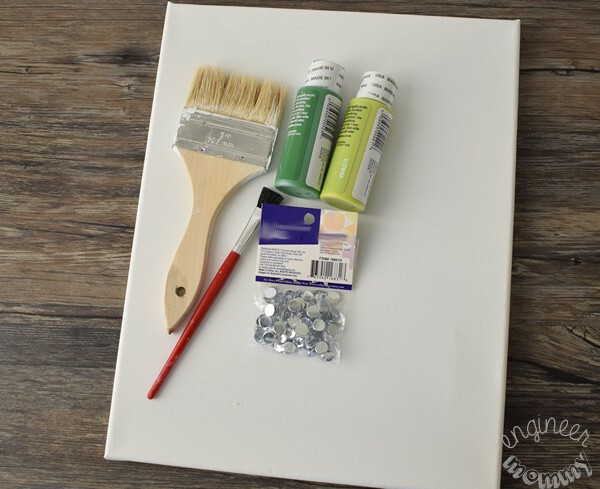 Start by gathering the supplies needed for the project: canvas, fan-shaped paint brush, acrylic paint color (brown, blue & a few shades of green). You’ll also want some silver gemstones to act as ornaments/lights on the tree. I didn’t want the background of the tree to be white, so I brushed on a light coat of pale blue paint. 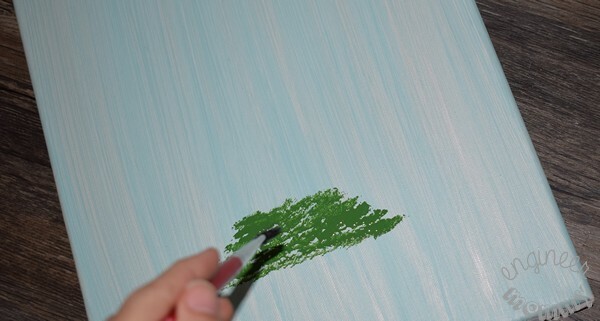 Start by dipping the paint brush in green paint and use a stippling motion to form leaves on the bottom part of the tree. Simply tap the brush onto the canvas and lift right up. 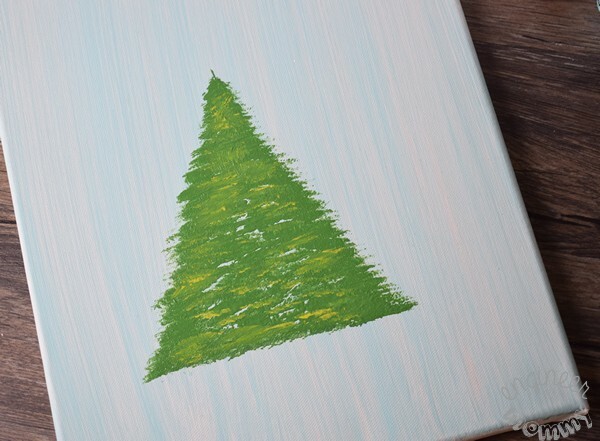 Start to form a triangle as you work your way up to create the outline of a tree. Don’t make it too perfect – adding stray leaves here and there will add to a realistic effect. Also, since real trees are multi-colored and multi-dimensional, I added some lighter green and darker green colors onto the tree so it would have a more multi-faceted look. For the top of the tree, I rotated my brush so that it would form a point at the top. Use some brown paint to add a trunk to the bottom of the tree. 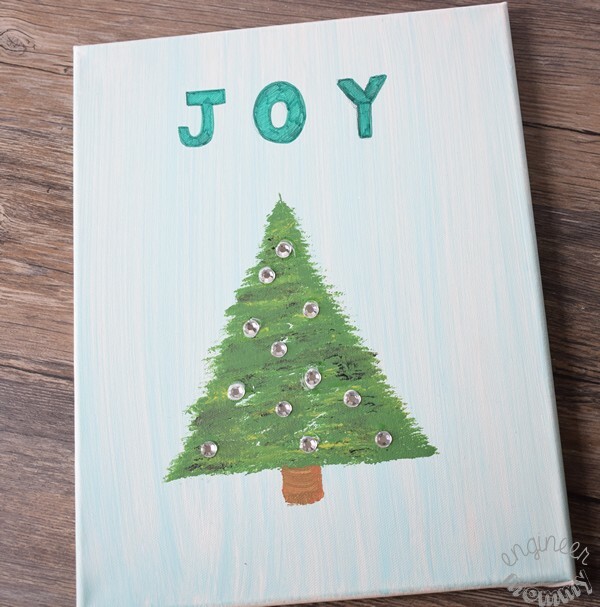 I love the word JOY during this time of year so I added it to the top of the canvas, but you can use any word that speaks to you. Also, adhere some silver gem stones to the tree for added glitz & glamour. I love the way this canvas looks in the bathroom. 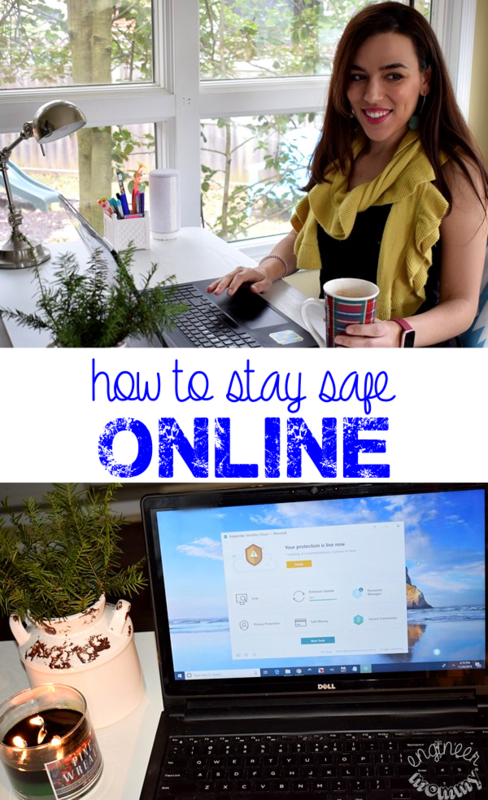 It was such a fun, easy project that adds a little pizzazz to an otherwise-mundane space. 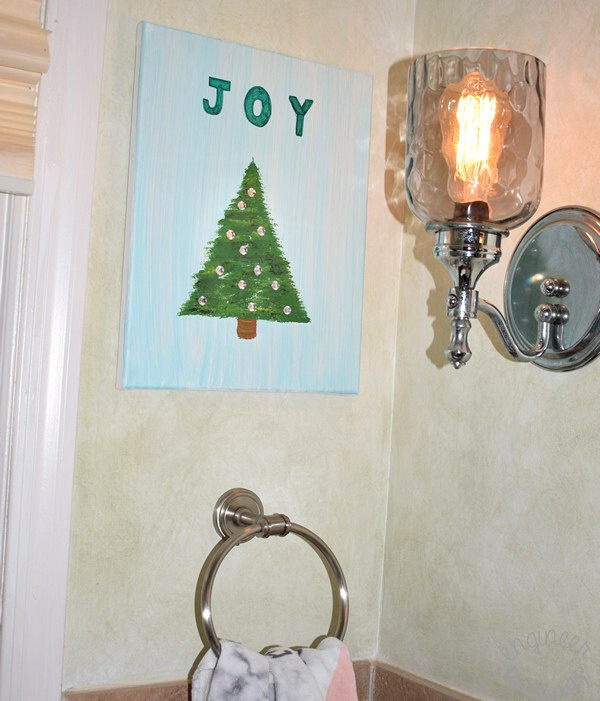 Making sure my guests see a little touch of Christmas, even in the bathrooms, is important to me. Making sure they also have the softest, most absorbent toilet paper (like the NEW Scott® ComfortPlus™ Toilet Paper) is also essential. It’s the only bath tissue that is made to care for you with everyday comfort plus a little extra! Scott® ComfortPlus™ Toilet Paper is actually superior to the competition. In fact, it’s preferred over Angel Soft (vs. Angel Soft® Double Roll) because Scott® ComfortPlus™ Toilet Paper is 5 in 1 (soft, strong, thick, absorbent, clog-free)! Talk about a multi-tasking product! These thick bath tissue sheets are designed for a premium, comfortable clean. Plus, they’re strong (3X stronger in fact!) By the way, if you used to purchase Scott Extra Soft, Scott® ComfortPlus™ Toilet Paper is the new & improved version of this classic favorite! I am so happy with how my artwork came out! 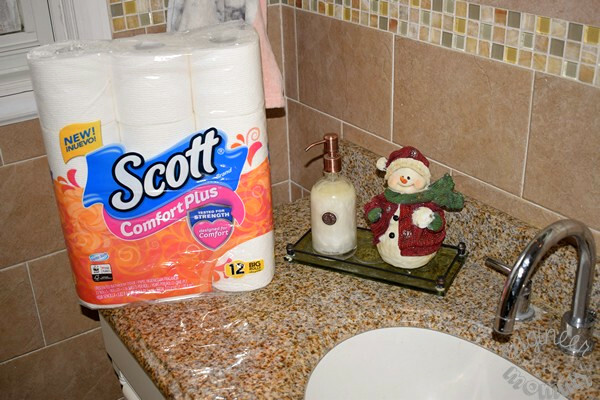 Look for Scott® ComfortPlus™ Toilet Paper at your local Family Dollar store and take advantage of the awesome circular offer available from 12/4-12/10: get the 12 CT Big Roll for only $4 (regular retail price is $5). Fill up the soap dispenser. Nobody wants to find the dispenser empty. Put out a festive hand towel. It is such an easy way to add a decorative touch. Place a seasonal figurine/candle/decoration on the counter top. Add some flowers to the bathroom for an easy touch of freshness. 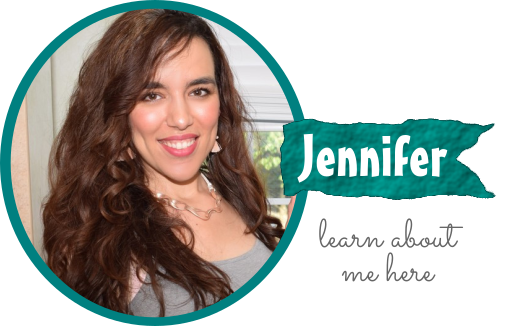 Make sure to empty out the wastebasket and leave out a box of tissues for guests. 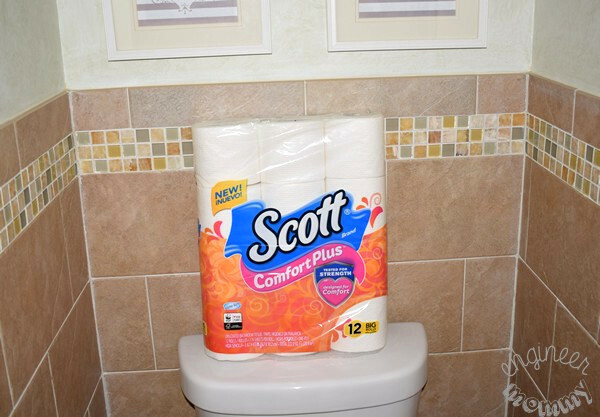 Check out the Family Dollar store finder to stock up on Scott® ComfortPlus™ Toilet Paper. 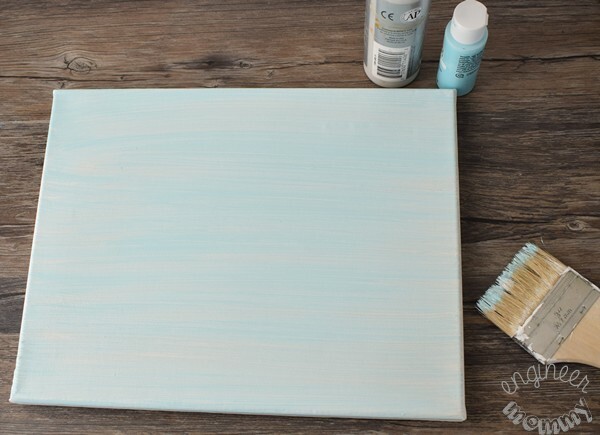 Have you ever made your own canvas art? 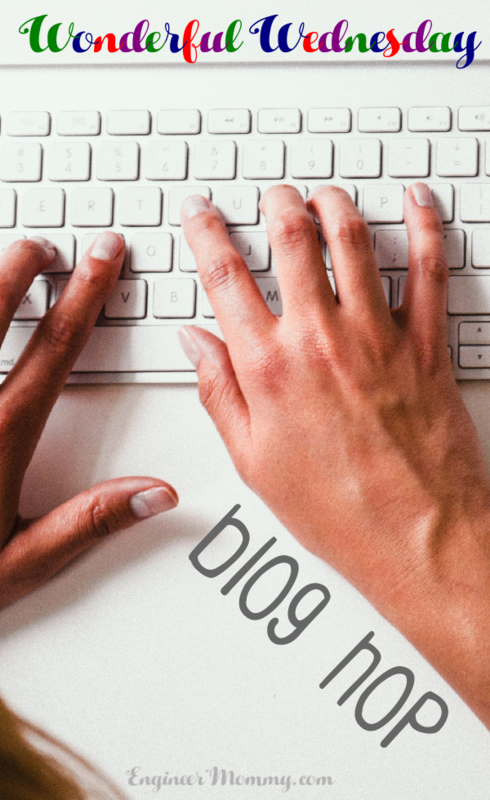 How do you get the house ready for guests? That is such a cute idea. I love that it’s easy to make! I should sit down this weekend and make one. What a great way to add beautiful holiday decor without spending a fortune. I’m not much of a painter, but I think I can do this one thanks to your helpful tutorial. That is so cute! I love to make hand-made things like this for the holidays. They really help make the season so much more special. It is always fun to take the time out of our busy days and make something we enjoy. Your project turned out very nice. Everyone needs the all important toilet paper. I love this art. So pretty! I need to stock up up toilet paper. My kids tend to go through tons of it. Thank you for the deal! That looks easy and fun to do. I am trying to find simple ideas that I can do with my kiddo and hang up for the holidays. This is perfect. That tree is the cutest and i wish i had the talent to make something so festive. I will show this to my son who has artistic skills and maybe he can make one for us. We keep the guest room ready for guests always vacuum, dust and add fresh linens for our guests the day of their arrival. Like our own little B&B. Super cute project and looks easy to do. Toilet paper is something we always stock up on around here. This turned out super cute. I love how simple it is to make, too. That is so creative my sister and I would love to have a painting session same as this. We always stock up toilet paper we have 3 bathrooms so we used a lot. Love it, such a cute art. Make one now. Thanks for an easy-great idea. 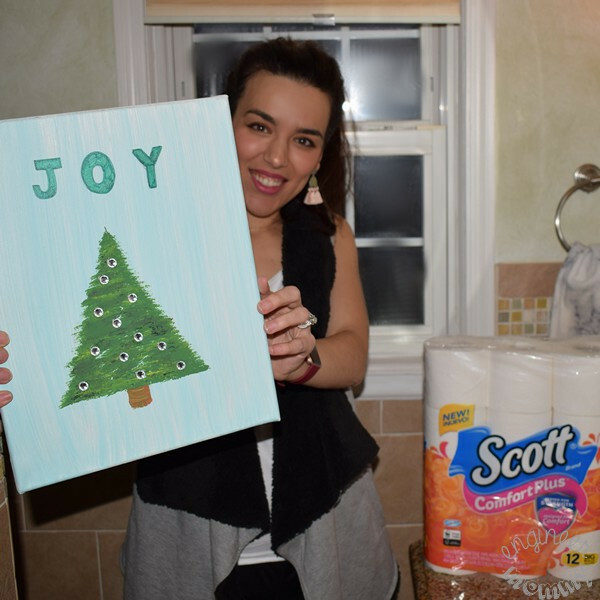 I love this DIY Christmas art! I wish I was more creative!! 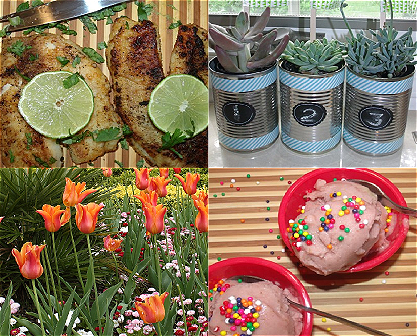 This is really great ideas to make DIY. I would love to do it in my home so easy and pretty. Love the craft. I have to make sure to stock up on this toilet paper, especially during the holidays. Nice and creative Christmas Tree Art. This is such an easy and yet creative idea. Something we will put to use this Christmas. That is such a lovely art piece you created! I need to try making some holiday decor of my own. You are very artistic, I wish I have that talent. I love your DIY projects, you always make it looks so easy.